Pothos has as many common names as it has uses as a houseplant in the temperate parts of the world. Devil’s Ivy, Variegated Philodendron, (which it is not,) Golden Ceylon Creeper and Hunter’s Robe are some of the common names that it carries in various regions of the world. Solomon Islands Ivy is the most accurate as that is where this versatile plant is native. Who Is It? 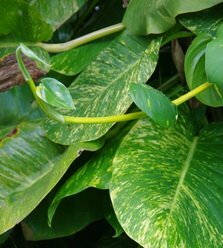 Epipremnum aureum is its botanical name and it is a member of the Arum family. When allowed to grow outdoors it becomes quite a different plant from the juvenile form that we see as a houseplant. The familiar, small, heart shaped leaves become very large with wide splits in them and they are borne up into tall trees on a very stout stalk. Most temperate region gardeners would not recognize their favourite little hanging basket without a close look to discover a few juvenile leaves at the growing point of one of these massive vines. Where Can I Grow It? Almost anywhere. It has an amazing tolerance for low light conditions. Even there it retains its characteristic yellow variegation on its variegated, heart shaped leaves. It is tolerant of many soil types and really doesn’t care if it stays pot bound in the same container for many years. I have had this one in a dark corner of the house for over ten years. Water Requirements? It will tolerate the widest range of watering conditions. When it does eventually run out of water it will let you know by noticeably wilting and then reward your neglect by picking up again as soon as you give it a drink. The picture shows a couple of shoots pruned from a larger plant. They are standing in a container of ordinary water and have been doing so for many months, decorating a windowless bathroom. 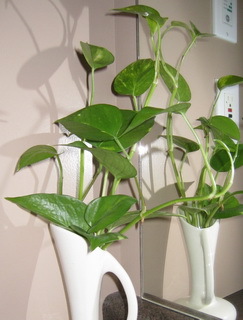 They root easily in water and can be transplanted into a container to start a new long lived Pothos. How Big Will It Get? As big as you let it. 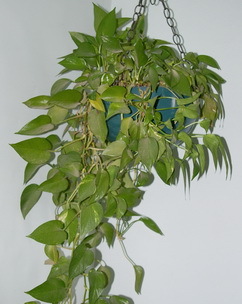 The vines growing from a 25cm (10") pot can become several metres long, either trailing down or trained up a pole to make a vertical Pothos. It is eminently pruneable however, so just chop away at it, to keep it the size and shape that suits your needs. If I could only have one houseplant I would have to choose a Pothos for its tolerance and versatility.